Music surrounds us. And we Indians wouldn't have it any other way, would we? 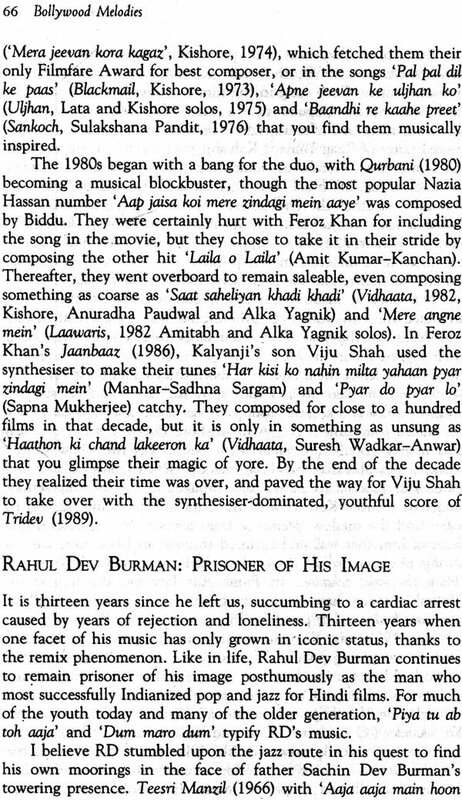 If you are an Indian and have been exposed to Hindi film music, just pause and look back through the mists of time, and you will discover that there is a tune buried somewhere in your consciousness which kick-started your first love affair. Without Bollywood melodies how would you have coped with those exhilarating and restless nights and days when you felt the first stirrings of attraction and passion? How would you have dealt with your achy breaky heart without the haunting melodies of love and betrayal sung by the icons of yesteryears like Mukesh, Rafi and the inimitable Kishore Kumar? Don't you thing it's time for you to raise a toast to a Sahir Ludhianvi or a Kaifi Azmi for giving you those life-altering insights that helped you grow from a boy to a young man? 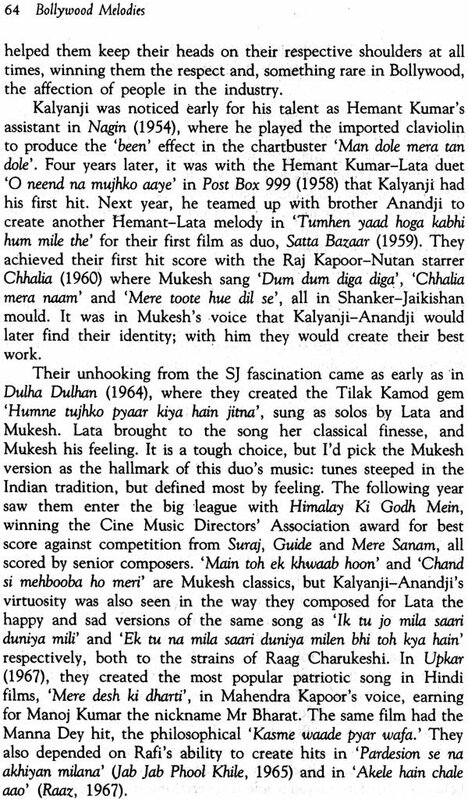 To acknowledge that the edge of the intense loneliness you felt was blunted by the soul-stirring melodies of Shanker-Jaikishan, Naushad, Madan Mohan and Laxmikant-Pyarelal? Whether you have lived through the 1940s, 1950s or are a new millennium youngster, there is no getting away from the inescapable fact that without Bollywood music, your life would have been so much more parched and colourless. 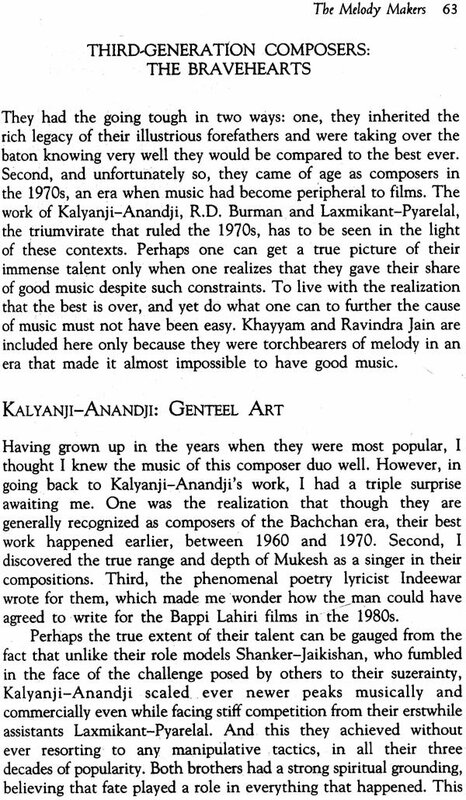 So, for those who want to revisit those times in their lives, this book by Ganesh Anantharaman, Bollywood Melodies: A History of the Hindi Film Song, is a true gem. As I flipped through the first few pages of this work of love and nostalgia that this young writer has put together, it hurled me back into the pages of history where I was thrown into intimate contact with the works of icons of every age, who have pulled out jewels from their hearts and scattered them through the sands of time. 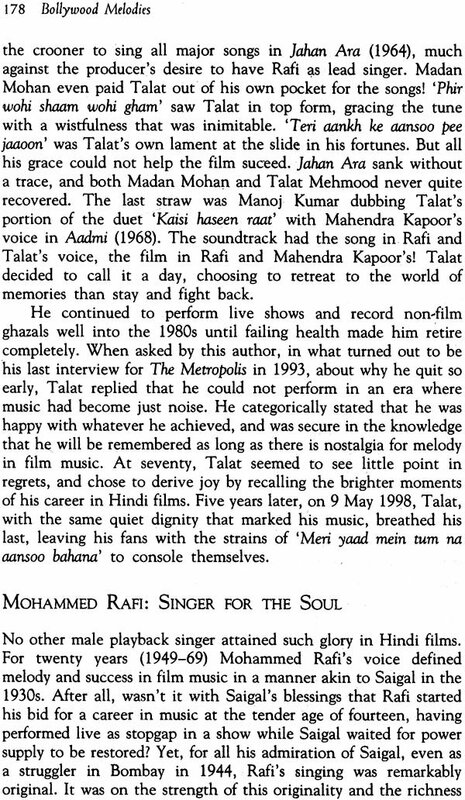 It was akin to taking a sepia-tinted journey through those glorious watershed years of Hindi film music. 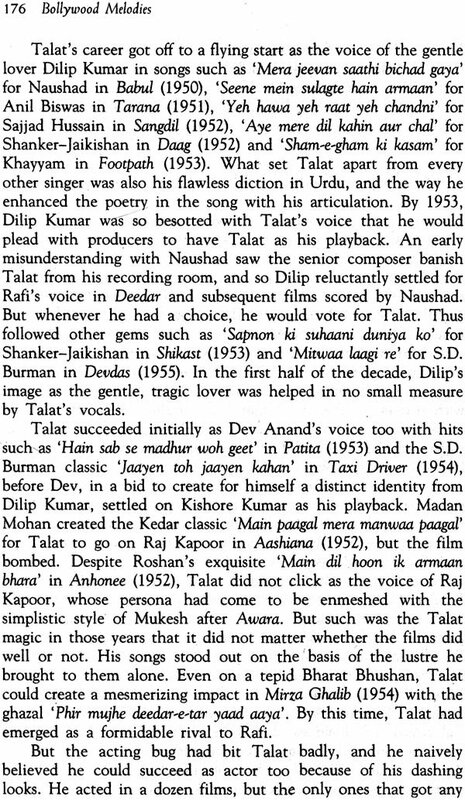 It was whilst reading about the 1930s, which was the era when the studios ruled, that I not only discovered that the first Hindi film song to be recorded in Indian cinema was from Alam Ara in the year 1931, but also something about my own genesis. The 1930s was the era when the talkies began and that in turn gave birth to the film song. And it was in the 1930s that my father came to Bombay, became a sound engineer and met my mother, who was an actress, which resulted in my birth nineteen years later in free India! 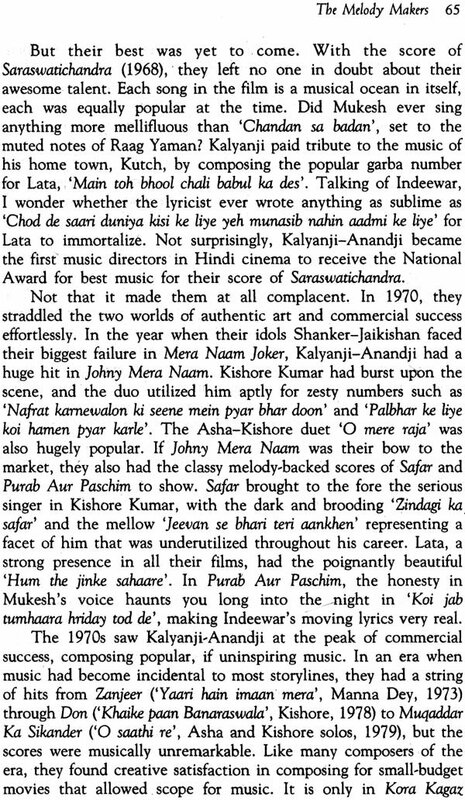 In my growing years, the highbrows who prescribed what is culturally correct looked down on Bollywood melodies. 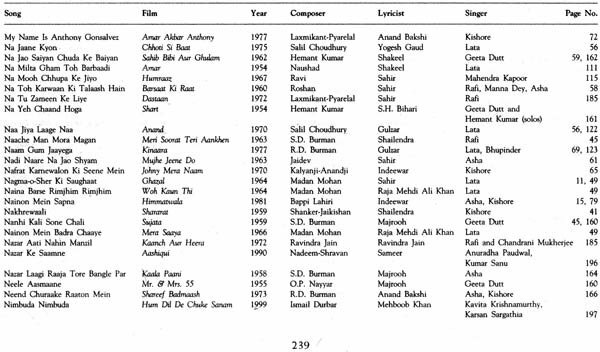 Those were the days when only classical music played on All India Radio and one had to tune into Radio Ceylon to listen to Ameen Sayani who would give us a sample of the Bollywood chartbusters every who would give us a sample of the Bollywood chartbusters every week in Binaca Geetmala. Those were the days when I would play huge LPs for my mother on a hand-operated old-fashioned gramophone, which you may find in Chor Bazaar's antique shops now. So much has changed since then! Today, my maid listens to music on her cellphone while washing the dishes, and FM Radio and TV programmes are making a killing selling Bollywood melodies. 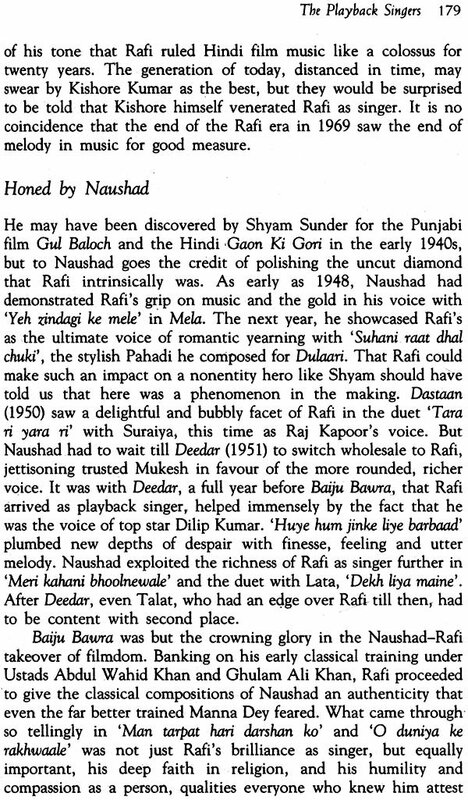 But alas, as Ganesh laments, somewhere in the mid-1980s the Hindi film song started to lose its 'Indianness', and it was only in the early 1990s with movies such as Aashiqui, Dil Hain Ki Maanta Nahin and Saajan, and the arrival of Nadeem-Shravan, that there was a return to the intrinsic Indian melody. It's amazing that, in spite of being an outsider, and an organization development consultant to boot, Ganesh has been able to view the spectrum of the music industry's journey with such clarity and insight. One of the most fascinating chapters of this book is his interview with Lata Mangeshkar, in which she talks about her childhood days when she was exposed to the music of Saigal. Noorjehan was her favourite among the female singing stars, and it was from her that she learnt the significance of Urdu diction. It is fascinating to read the nightingale of India emphasizing how critical it is for a singer to be able to articulate the words of a song in order for it to leave its true impact. And then in closing, she goes to the heart of the problem of our times when she says that it is the need for instant success today that has resulted in the disintegration of music. She minces no words when she states that it is because the Indian landscape today is bereft of mentors of the likes of Ghulam Haider, Anil Biswas and Naushad, under whom she had the privilege to study, that music has become so soulless and mindless. She clearly says it is not because the singers are less talented but because of the lack of composers today that we don't have music that endures. Ganesh needs to be applauded for getting the gentle and generous Lata to the practitioners of Indian film music to bail them out of this sterile phase that they are stuck in. Remembering the past may seem like a mindless indulgence in nostalgia to many. There is no denying that the past is a collection of shadowed memories. Nonetheless these memories can help many of us connect with our lost heritage and help us shape our future. At times it is necessary for one to go back if one wants to go forward. The past chronicled in Ganesh's book can provide us with material for creating new tunes and weaving new myths. There is a magical 'there' yonder that will reveal itself if you look hard enough in the rear-view mirror of the past. Ganesh's book plays the part of that rear-view mirror. Come gaze into it. 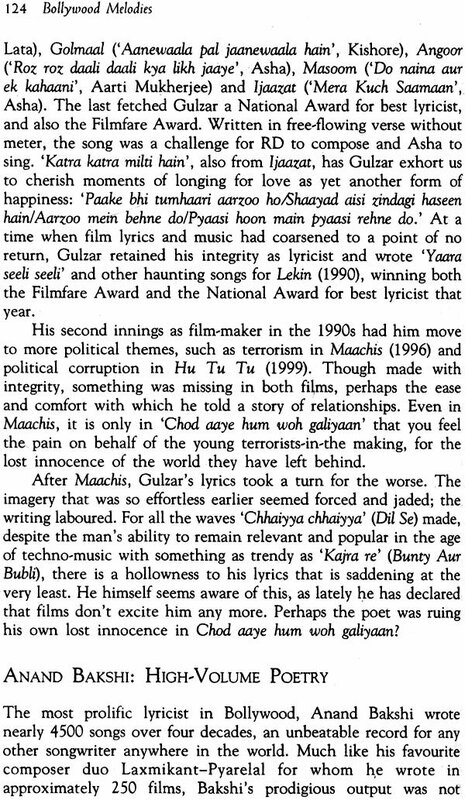 The idea of writing a book on Hindi film music took hold of me way back in 1989, when I had just stepped into my twenties. It took me fifteen years to get down to writing it. 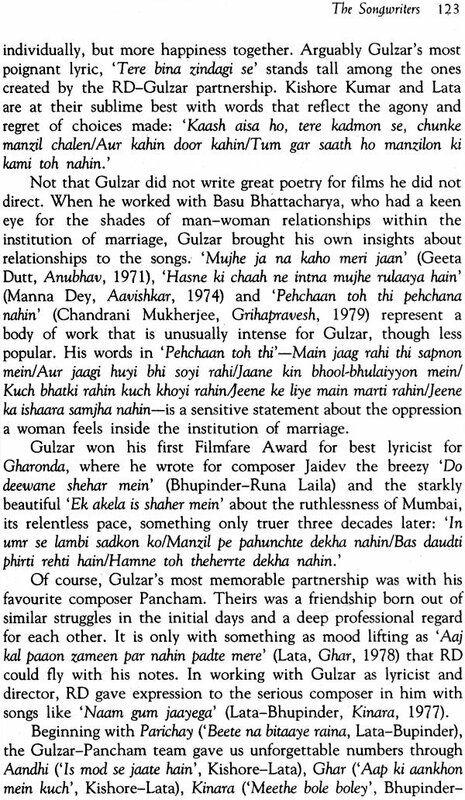 But I guess, the book ws taking shape in my mind during all the intervening years, as I kept listening to and thinking about the music of the 1950s and 1960s, firmly holding on to my belief that those were the most creative years for Hindi film music. Even if it amounted to a prejudice, I am glad to have nurtured it for so long, because it is on the strength of that conviction that I got started with this book. Though I wasn't enthusiastic at the start, I agreed to my editor's suggestion that this book have a wider span, covering the origin, growth and decline of Hindi film music during the period 1935-2005. In retrospect, I am thankful to him, because in the course of writing this book, I have had the joy of discovering the music of the 1930s and 1940s, and the pleasure of rediscovering the music of the 1970s and 1990s. I don't and 1960s were the best years, but today I am more objective, less dismissive of the music of the later decades, and the people who made it. 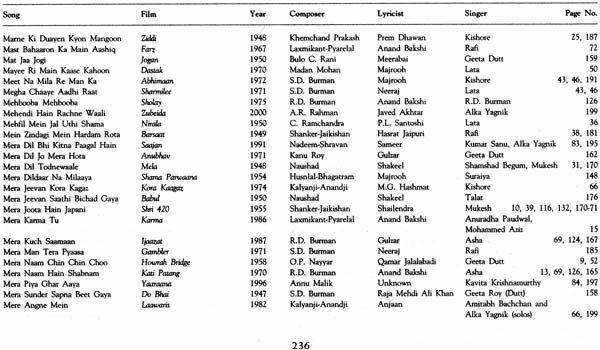 This book is meant to be a history of the Hindi film song, but a selective one, through an account of the work of some of the most prominent musical personalities. The effort is not so much to provide complete or objective information to the reader, as much as convey my own subjective experience of the music all these people made. The opinions are mine; the choices on the personalities included in this book and those left out are mine too. Therefore, I take complete responsibility for the shortcomings of the book. I am aware of many of them: factual errors being the first. For many films, there is no conclusive authority on the year of their release. The same confusion exists about the years of birth of some personalities. Perhaps it is the consequence of so little documentation being available on this genre. Secondly, this book does not talk much about the music of the twenty-first century. Partly because I don't find it very appealing, having always equated music with melody, but also because I think we are too close in time to be objective about the music of the present. Third, many musical personalities get only a passing mention; some not even that. The only defence I offer is that I have written about people who, in my opinion, mattered most to film music, and not about people who, despite talent, were insignificant in the overall scheme of things. 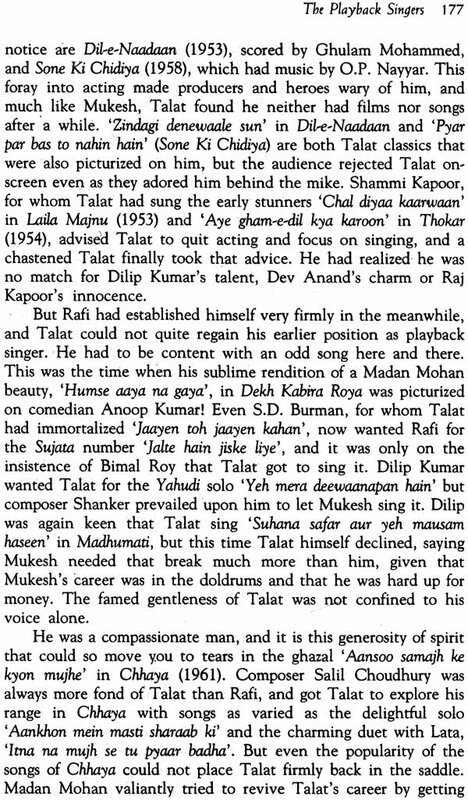 'De de Khuda ke naam pe' sang Wazir Mohammed Khan in Alam Ara (1931), giving birth to a phenomenon-the Hindi film song has traveled a long way, influencing and being influenced by popular taste. Considered down-market not so long ago, it is undoubtedly the most popular musical genre in India today, pervading almost all aspects of Indian life-weddings, funerals, religious festivals, get-togethers and political conventions-and emerging as a medium to articulate every shade of joy and sorrow, love and longing, hope and despair. 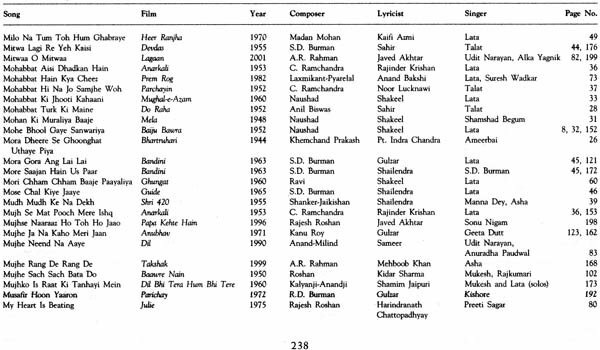 Bollywood Melodies traces the evolution of the Hindi film song to its present status as the cultural barometer of the country, through an evaluation of the work of over fifty outstanding composers, singers and lyricists-from K.L. Saigal to Sonu Nigam, Naushad to A.R. 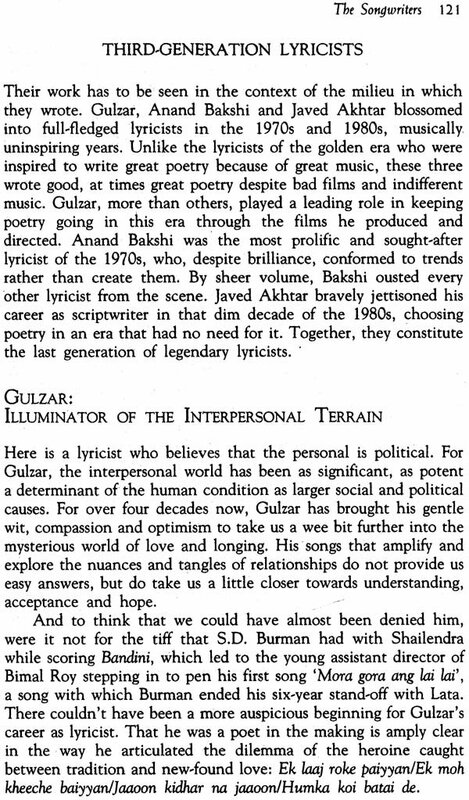 Rahman, Sahir Ludhianvi to Javed Akhtar. 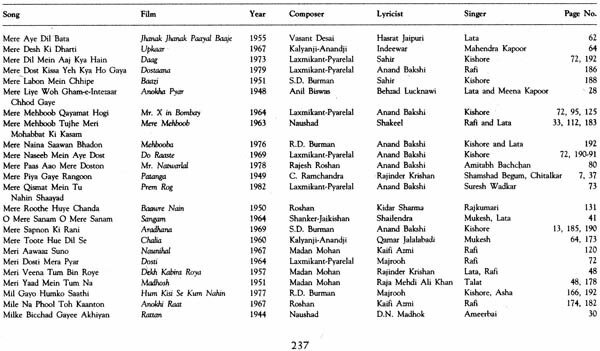 Placing the song in the social context of the times, Ganesh Anantharaman looks at the influences that shaped it in each era: Rabindra Sangeet in the 1930s, the folk-inspired 1940s, the classical strains of the following decade and the advent of Western beats in the late 1960s. 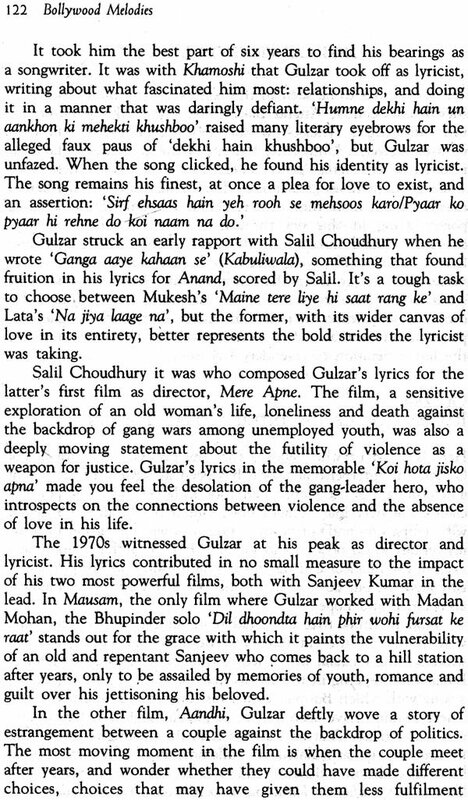 the author also chronicles the decline of music in Hindi films over the next twenty years before a new crop of musicians and singers gave the film song a new lease of life.